Plot: Main character(whose name we never get to know) wakes up one day transformed into a pig. 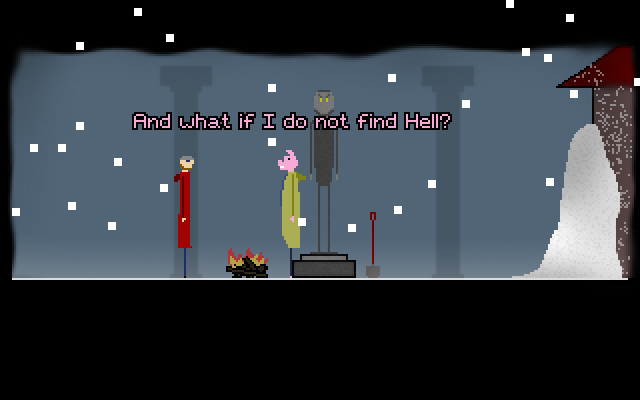 Once he leaves his warm house, he is confronted by a different world. On his journey to investigate the chaotic happenings around him he comes across the true meaning of it. No, it is not a dream. 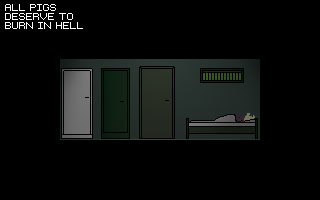 What to expect: A very simple, point and click adventure game, with minor horror elements. Puzzles are fair, make sense within the game world and are not hard. This game was originally supposed to be made for a MAGS competition in January, with a theme "Something Cold, Something Burrowed, Something Pink". 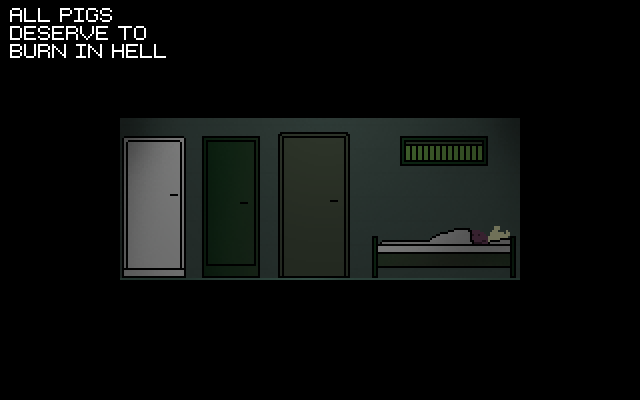 "A solid little game with an interesting concept. With a little more polish it could achieve a higher rating." A little out there for me, but has some interesting ideas. The music and writing sets a good tone. This game is about being trans. I didn't understand it the first time I played it, long ago. I just watched a playthrough of it and it struck me right away. Everything in this game has a meaning, though I doubt it can be understood by those who don't go through this. A game unlike any ever you will play (probably). An interesting but strange idea for developing a game structure that works surprisingly well. A very enjoyable game with atmosphere that pulls you into the game world. I enjoyed everything about this game, especially the puzzles. Great job! I've reached 3 different endings so far. Are there more? Interesting game. I didn't understand everything but it keeped me inside it. Interesting little game about the (oniric?) adventures of an antropomorphic pig. It tries to be deep and pulls it off without being pretentious or obscure. An interesting and unusual game - it was a pleasure to help play test this. 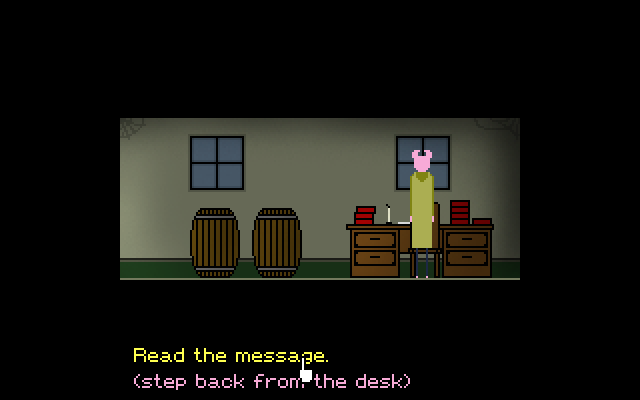 This game had me as soon as I read/saw that the main character is a humanoid pig -- and it only got better from there. The world does seem a little desolate -- but that's what it's about: the dreary, chilling atmosphere. The story is quite clever -- and so are the puzzles. Very enjoyable -- if a bit sad.